Education must move with the times. What can be done to reach a technology-savvy generation that relies on media every free second of their time? BYOD-Bring Your Own Device, a trend that is catching on quickly. Bring Your Own Device has transformed the classroom by creating new opportunities for learning. Studies find that Generation Y is highly reliant on wireless devices and phones. And rather than fight it, educators can use this to their advantage. In Millennians: A Portrait of the Next Generation, the researchers found that most of Generation Y prefers to connect wirelessly (81%) and the majority use social networking to connect with others (73%). Merging education with these devices seems a logical step. C&R market research found that more students own a cell phone at younger ages: With 22 % owning a cell phone at ages 6-9, 60% of tweens (ages 10-14), and 84% of teens (ages 15-18). Since most students already own a cell phone by high school, it’s a resource that many educators are arguing should be used in the classroom. Much like calculators and ball point pens, it took a while for educators to accept the BYOD trend, but it is becoming commonly accepted. Why Does BYOD Makes Sense For Educators? BYOD is cost effective.Computer labs are expensive and costly to replace. For example, many libraries are moving away from computer labs and actually leasing laptopsfor use in public facilities. BYOD eases the demand imposed on schools. It allows the most effective use of most recent technologies in the classroom, since students replace the technology themselves. Embracing these tools makes education more interactive.Technology can make learning fun and engaging! Teachers and students might create podcasts, use a software voting tool such as Polleverywhere, or design a digital scavenger hunt. The interactive nature of BYOD hones in on student learning. Digital books often include free supplemental resources, such as study guides, chapter outlines, and interactive tests that monitor progress and provide immediate feedback. BYOD makes differential instruction easier.Teachers can use media to meet different learning needs. BYOD allows students to be in control of their learning. Many tech tools can help students with disabilities or even translate words for ELL students. Gifted students can research more advanced applications and students who need practice can do so individually. For instance, some districts are using programs like Think through Math, which tutors students online in real time. Portable devices make learning a part of students’ lives. BYOD bridges the gap between in school and at home learning. According to an article in edudemicabout cell phone use in schools, learning becomes easier to achieve, as it is more collaborative. Students can integrate the device into their daily lives. Using Remind101, teachers can send email reminders or course syllabi. They might text each other to discuss homework or arrange social media study groups. A free application called Studyboost, allows students to receive study questions via text. Cengage Brain even allows college students to use their cell phones or IPads to prepare for tests and read their digital e-books. Students might use their devices to break away in small discussion groups, with one taking notes and others finding relevant questions related to the class topic. Kindle, Wikipedia, and Google books offer a list of free textbooks that students can access in the classroom. BYOD is a manageable strategy with proper discipline rules.For those who fear devices for the potential of rule bending, BYOD provides new learning opportunities. Educators can teach technology etiquette and ethics, which is becoming increasingly necessary. BYOD can be managed like any other resource in the classroom. Guidelines can be put in place to restrict use to learning. At the workplace, some employers are using Mobile Device Management software, which can mitigate the risk of sensitive information. In the future, this technology can be further adapted to the meet the needs of schools and prohibit inappropriate use. BYOD saves learning time. BYOD makes collaboration easier. Research can also be done faster. More diverse sources can be used to support learning. The alternative seems archaic: Go back to microfilms? I remember sitting for hours in the library looking at microfilms and reference shelves for articles. Educators might even educate students about how to evaluate and find the best resources in a particular field. Virtual walk-throughs are easy with technology at their fingertips. Engaged learners are better learners. Bring your own device puts students in a position of power over their learning. Many educational researchers argue that giving students the authority over their own learning is best: the teacher becomes a manager of learning, rather than a direct source of information. Students might use technology to formulate their own questions about topics, instead of having the teacher pose inquiries. Bring your own device can be used to engage experts from outside the classroom.Students can use communication features to engage in projects that require contacting the community or local leaders. In fact, millenniums are more likely than any other generation to contact leaders and engage in community service projects. Students can apply learning to real scenarios. For example, students might compare candidates’ political views from their website or advertise community projects on Facebook. BYOD is becoming the norm in the workplace.Educators have the responsibility to prepare the millennia generation to enter the workforce. Teaching students to use portable devices is necessary. According to Littler: Employment and Labor Law Solutions Worldwide, in an article titled, “The BYOD To Work Movement”, technology is blurring the line between work and pleasure. Little argues that employers should prepare to manage this “irreversible” trend due to the changing landscape of the nature of the “workplace”. Many new employees choose a combination of working at home, or using after work hours to answer emails or attend to lower priority tasks related to their work day. Practice with BYOD in education will better prepare students to have a healthy work and life balance. Some technology experts and CIOs are predicting the death of the personal computer .The further proliferation of portable devices – tablets, phones, laptops, readers, and other portable devices (perhaps more powerful laptops and new types of “cloud” devices) will further influence how schools view BYOD policies. To talk about this trend, I contacted a software developer for cloud. He predicts that new cloud technologies will change education. When asked how cloud might be implemented, his reply was, “The sky is the limit.” Cloud will revolutionize education in ways never thought possible, such as through easy to access cloud libraries, interactive smart boards, and cloud computer labs. 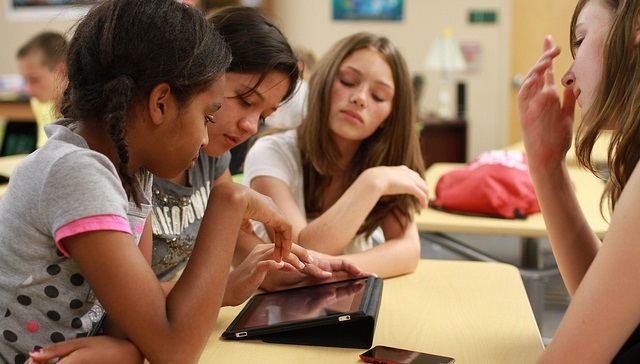 Why Should Educators Jump On The BYOD Bandwagon? Embracing technology early allows better implementation and quicker development of learning tools. Teachers can help shape the emerging technology. Demand creates an environment where companies will respond to the growing needs of educators. Better tools will be implemented to meet the needs of students. Being an innovator gives teachers the chance to make these devices easier, friendlier, and safer to use in classrooms. After all, isn’t it our responsibility as educators to provide the best possible resources available to our students? Bring your own device…do you really think students will not text, etc, in the classroom to their friends and others? One of the problems of education is that students are not getting in school what they need to find work. University and college placement centers are woefully inadequate — universities and college socialize students instead of honestly preparing them for AVAILABLE jobs in the real world. Monstrous athletic programs waste money that could used for academics. It is estimated that the average teenager texts about 3700 times a month. If that doesn’t alarm you, then I don’t know what will. Students loans have doubled recently…too many loans and grants are not paid back…you can go on and on. The bottom line is that our education system is basically not addressing the needs of students to find employment, and not giving them the basic skills to do so. On the second point, technology is one of the greatest growing sectors of our global economy. But I think for the reasons you mentioned BYOD actually does address the needs of students. It is a tool they are very familiar with, so why not harness it to improve education and engage students? I strongly believe we can educate students to use technology for educational purposes. Technology use in the classroom would prepare students better for the workforce too. Ignoring technology won’t make it go away. There is a research project called “Project Red, Revolutionizing Education”(www.projectred.org) that considered how 1:1 technology use in schools might affect student achievement. The mega-study was the largest of its kind, studying the use of technology in classrooms-they included 997 schools in 49 states of the USA and found that properly implemented technology actually improves student achievement. They also found positive financial benefits for schools, as well as learning productivity and student engagement. I agree with their introduction statement, “Technology is woven into every aspect of our lives, and education is no exception”. We can harness it to help students. I believe BYOD actually saves money and is a powerful resource. Thank you for your comments! – My goal is to create meaningful discussion about these issues. BYOD is one of those policies that does have some issues on implementation but it may get easier as security improves with new devices. I found this article again by looking myself up. I realize that electronic devices are a part of education today, but perhaps these devices do more harm than good. I have collected a small library of “real” books to keep and “reread” at my own pleasure. Our world is moving too fast and missing many simple and refreshing ideas that are’nt popular. Unfortunately, most folks are too busy “being in a hurry” to pause and reflect why they rush around in a frenzy. That is the danger of an electronic world. Personally, I feel this will help incapacitate the world we live in. Please take a good look around you.